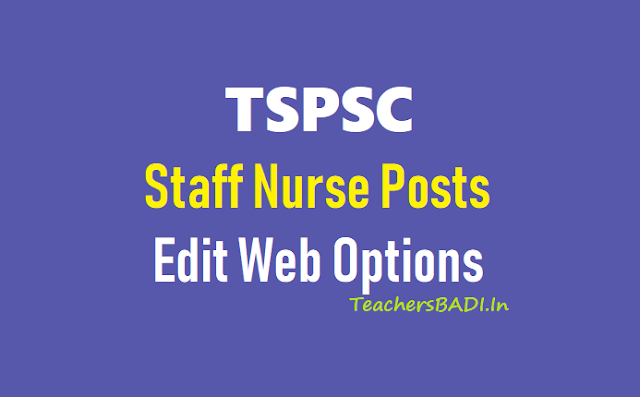 TSPSC Staff Nurse Posts: Edit Web Options from 16/07/2018 to 18/07/2018/ The Edit web Option for the post of Staff Nurse notification no (21/2017): The candidates who have attended for Certificate Verification from 04/07/2018 to 07/07/2018 for the post of Staff Nurse are hereby permitted to edit their Web Options / Post Preferences for the various Societies and Zonal preferences to the said posts from 16/07/2018 to 18/07/2018. All the candidates are instructed to note that failure to exercise web options/ post preferences for jobs will result in not being selected for any post. Further, candidates are requested to exercise web options carefully as insufficient web options can result in not being selected, though vacancies may be available. Hence it is advised that as many options as possible be exercised in order of preference. In case of posts of Staff Nurse, it was represented by some candidates that they have not exercised web options or committed mistakes. This is the only opportunity to edit web options. The web options / post preferences now submitted cannot be changed under any circumstances. Note: The candidates satisfied with web options given by them earlier need not give again. Please see the vacancies break up for making well informed exercise of web options / Post preferences. For further details please visit Commission’s website (www.tspsc.gov.in).